10 August 1945. In accordance with the Emperor’s decision, Japan’s Foreign Ministry sends telegrams to the Allies agreeing to a surrender provided the position of the Emperor is not prejudiced. The Allies reject this proposal two days later. 10 August 1945. A day after its forces joined the Soviet attack on Manchuria, the Mongolian People’s Republic formally declares war on Japan and receives the first of many unification calls from Inner Mongolian leaders. Next day, the official organUnen Sonin, which only a month earlier had switched to Cyrillic, reverts to traditional Mongolian script to reach a wider audience. It reports that the war aims to unify all Mongols on the Mongolian plateau. 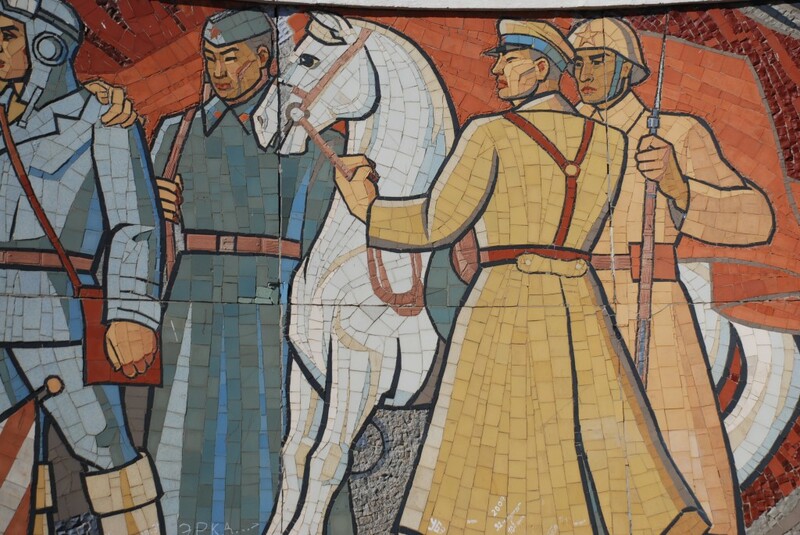 Mural from the Zaisan Memorial, south of the Mongolian capital of Ulaanbaatar. 10 August 1945. Looking to thwart Chinese aims to occupy the Crown Colony and return it to Chinese rule, the British cabinet agrees to send a British fleet to Hong Kong. Pro-British (Chinese-Macanese) agents also send an order to Franklin Gimson, the Coloni al Secretary for Hong Kong, to formally re-establish British colonial rule. Gimson is still being interned by the Japanese in Hong Kong. 10 August 1945. Uncertainty about who will do what, and when, characterizes the entire region in mid-August. While the Philippines, for example, is beginning to rebuild after years of war and Japanese occupation, the country seethes with preparations for the invasion of Japan. U.S. military supplies pour in. Hospitals and other facilities are established in anticipation of the invasion efforts. Elements of the Philippine Army are also involved. Early but unconfirmed news of Japan’s surrender on the 10th results in premature celebrations in Manila, including the firing of weapons. Similar early celebrations erupt four days later when the U.S. Office of War Information newspaper Free Philippines prematurely announces the end of the war. 10 August 1945. With Japanese forces in Manchuria reeling before the Soviet onslaught and MPR troops advancing in Inner Mongolia, Stalin personally warns the Chinese government to sign a friendship treaty before it is too late. Negotiations have been stalled for months, with China resisting Soviet demands for extensive concessions in Manchuria and recognition of Outer Mongolian independence. 10 August 1945. Chu Teh, CCP commander in the north, announces that Japanese soldiers may surrender to any anti-Japanese armed forces (including the CCP). Next day, CCP leader Lin Piao begins force-marching a large army along the Peiping–Mukden Railway into Manchuria ahead of Chinese government forces.